Okay, I admit that I signed up to be the first snack mom of the week to set an example for the others. What qualifies me for this role? The way I see it, who else could possibly obsess more about every morsel entering their child's mouth? Is there another mom in Izzy's class as au courant as I am about the latest unhealthy snack discovery? 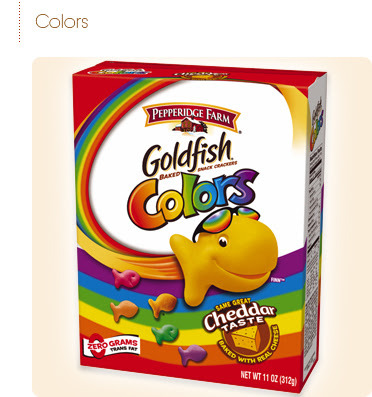 Which reminds me, Izzy mentioned that last week's snack included Rainbow Goldfish. I had truly hoped that he invented this idea but I soon discovered that they do indeed exist. The worst part is that they obviously contain food coloring, which, according to last week's New York Times, have been linked to hyperactivity in children. Just one look at the bag in the supermarket was enough to tell me I wouldn't want my child going near those. They are chock full of dyes of every color, including red, yellow and blue. Sad thing is, when I googled "Goldfish," I discovered that they were included on many "approved" classroom snack lists across the country. It is a true shame that we are teaching children to eat industrially processed foods and sending a message that homemade cupcakes or other baked goods are unhealthy. I can't believe that homemade cupcakes and other homemade items have been banned from many schools. One of the supposed culprits is the high incidence of allergenic children...now really, if your child has severe allergies, wouldn't you just send in special foods for him/her anyway? Why do all of the students need to be penalized? I know a mom who goes to great lengths to keep her child on a special diet but she goes out of her way not to impose her child's way of eating on his peers. She manages to keep him contented with snacks and lunches that rival those of his classmates. I applaud her for her efforts and wish she could be used as a role model for mom's with allergenic children. You are so informed about the food you feed Izzy and really, I am amazed by it every time I read your blog. Glad you put this post up in my comments section. I do bow to you, my dear. You are the queen!! !